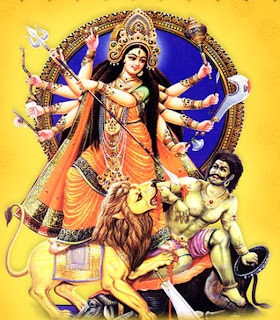 Durga Ashtami is on 22 october in 2012. The eighth day of Navratri of great significance and is dedicated to the Goddess Maha Gowri in the form of Goddess Durga. Gowri or Gouri is another name of Goddess Parvati. 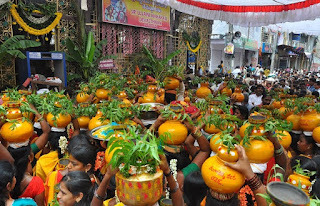 Bathukamma festival is celebrated in Andhra Pradesh during the navaratri. This is the biggest Hindu festival in Telangana region of the state. The most significant Durgashtami, which is known as Mahashtami, falls in month of Ashwin during nine days Shardiya Navratri festivities. Special pujas are observed on Shukla Paksha Ashtami. This festival is celebrated as a memory of the day where Durga came out victorious over the demon buffalo, Mahishasura. Durga Puja is a festival which is also said to be the festival of Good Winning over Bad, as Goddess Durga winning over Mahishasura. Durgashtami day overlaps with the next day to end with a Sandhi Puja, puja performed for the overlapping of Durgashtami with Mahanavami. The actual worship of the Goddess Durga as stipulated by the Hindu panchagam falls in the month of Chaitra, This festival Durga Puja is a celebration of life, culture, popular customs and traditions. It is a time of reunion and rejuvenation to love, to share and to care. On the auspious day devotees of Goddess Durga start the celebrations on the morning of Maha Ashtami with Pushpanjali. Devotees perform the ritualistic bathing and fasting before offering Pushpanjali. Fresh flowers are held in hand and chanting the mantra after the priest. After completion of every mantra pour flowers at the Goddess's feet. Sandhi Puja is one of the most important ritual during Durga Ashtami-Durga Puja. The 48 minutes interval Sandhi when Ashtami Tithi transits into Navami is highly sacred. Half of it falls in Ashtami and another half in Navami. At this time Durga is worshiped as Chamundi (The form killed the Mahishasura). The worship of little girls, called kumari puja, is the main attraction of the day. Kumari Puja is the puja where in a young girl, with age of 12-13 is worshipped, as the young girl representation of Devi Durga. In the evening Astra puja, worshipping the weapons of the Great Goddess Durga is carried out on this day. Durga Ashtami which occurs in March or April is called Basanti Durga Puja. Bagala and Narayani form of Durga is worshipped mainly in Gujarat and Maharashtra on the day. Bhadrakali form of Durga is worshipped mainly in Kerala. Durga Ashtami Puja is observed on this day in many parts of India mainly in Bengal, Orissa, Jharkhand and other eastern parts of India.